Architecture has transformed from a complex creative process of integrating diverse functions, structural systems, myriad services and utilities, inter-related spaces and exterior-interior visual connections into a game of appliqué where one cuts and pastes decorations and ornament onto four sides of dull boxes. The building in the picture above has a facade that is completely covered with sheets of perforated metal and acryllic sheets. 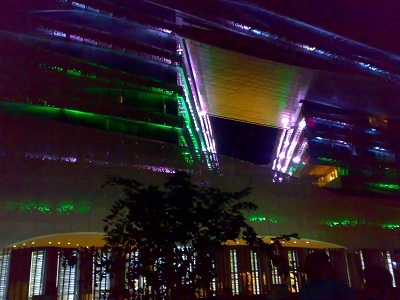 Diffused lighting technique has been used to illuminate the facade of the building. The use of diffused lighting has been used in an innovative manner. All of us agree that when we evaluate a building for its overall appeal, the exterior facade takes the first place. The exterior aesthetics has gained more importance than the interior functionality. The building has to be made look visually pleasing. Ornamentation without function is otiose. But the trend has changed which has changed the definition of Ornamentation. According to the new trend, “Ornamentation is the function”. Much in the same manner that fetishism killed the early modern movement with the World Exhibition in Chicago in 1893 overshadowing the likes of Sullivan and Richardson. All the changes and want for external beauty of the structure has made Architecture commercial graphic art of decoration. Architecture is the art of connecting interior spaces to the exterior. But unfortunately this definition is no more viable. I thought cladding was some kind of finish done with a specific material to achieve certain function or add an element to the aesthetics of the building. What happens behind that velvet covered box is out of scope of total Architecture and is relegated to structural and service designers who the architects need never ever meet. The role of architects is becoming limited to the design of outer envelope of buildings. If you do anything more, you are insulting art! The aesthetic revolution was caused by several transformational factors that are redefining the meaning of architecture. Cold shells whose functions are not known, or even clear during the design stage are replacing buildings with specific functions. Installation of air-conditioning systems is leading to hermetically sealed buildings with no fenestration. Artificial illumination is supposed to be better than daylight and people inside working for 24/7 aren’t supposed to know what is it anyway. Many new building types have no relationship between what is happening inside of a building and outside it. The client wants blank walls to be decorated later. The designing system has undergone a diverse change. Architect is not the sole person who creates the total design along with functional and aesthetic aspects of the interior as well as the exterior. The Architect is left only to create volumetric box and to decorate the skin. His sights should be set on creating the most beautiful velvet box where the interiors and exteriors need not necessarily bear connections. More and more, the only role of architects is to create volumes that achieve maximum FSI and achieve maximum saleable area. Highly articulate and determined spaces, structures and elevations are often considered dangerous, or bad investments, as they could limit the types and numbers of buyers, users, leasers and renters. Architecture in the modernist sense is bad business. Even new environmental considerations have made designers see the skin of a building more in terms of its insulation, reflection qualities and radiation factors. To many architects, these new restrictions are in fact a kind of liberation. They no longer bother between the relationship of the interiors and the exteriors. This trend is responsible for the emergence of new facade technologies. Stainless steel clips allows us to paste thin sheets of stone across broad strips of wall. Various materials have been discovered for the cladding of the exterior facades of the building. The commercialism has replaced creativity in architecture. Various shapes and forms that is “Freeform Architecture” is no more in an ideal way of design. Architecture is a spiritual field of art. These technological advances have brought a great change in the field of architecture. Commercialism has become the core of design. We future architects must try to preserve the integrity of Architecture. We should help preserve the principles of architecture that invoke creativity in the designer. Creativity is the soul of Architecture and should not be replaced by commercialism. thank’s for your information. it very helpfull for me. thank’s! i hate to be ‘deviant’ from today’s trends but really, i don’t believe in ‘ornamentation is the function.’ I’d rather say, ornamentation is most of the time, a waste! Ornamentation is a waste if it does not serve any purpose or function. Ornamentation cannot be totally eliminated from design. Using ornamentation for aesthetic appearance of the building to some extent is necessary. that creates new spatial effects and comprises holistic atmospheres.